The Partner’s sister is in town and staying in the City Hall area. The last time they were here I was busy preparing for the wedding. So I was quite appalled to hear that they were eating breakfast daily at Spinelli! I’m like YOU SPENT $10 on a generic sandwich there when you could have gotten much better at the independent cafes and sandwich shops??! So I’m making sure that no such thing happens again, no way, not anyone remotely related to a food blogger! So here’s a list of nice cafes and good eats around the City Hall / Raffles City area. I’ve only listed my personal favourites or places where I would recommend. This is a really good location to stay at if you’re looking for good hotels in Singapore as the red coloured building in the map is the City Hall MRT interchange station. The City Hall area is also known as the heritage/ museum district, with quite a number of museums within walking distance! The oldest church in Singapore, the Armenian Church is also 10 mins walk away! When in Singapore, you must try out the local coffee and our favourite breakfast, snack and supper all rolled into one, the ubiquitous KAYA TOAST. Apart from being available at all coffee shops and food courts, my favourites are from Yakun Kaya Toast and ToastBox. Soho Coffee – good coffee here and western dishes. Paradise Inn (2nd Floor) – Good and pretty affordable Chinese restaurant. Chinese, Italian, Western, Pubs, all available here. Budget $25 and above for mains usually. Lei Garden (ground floor) – One of my favorite places for Yum Cha and Double Boiled Soup! 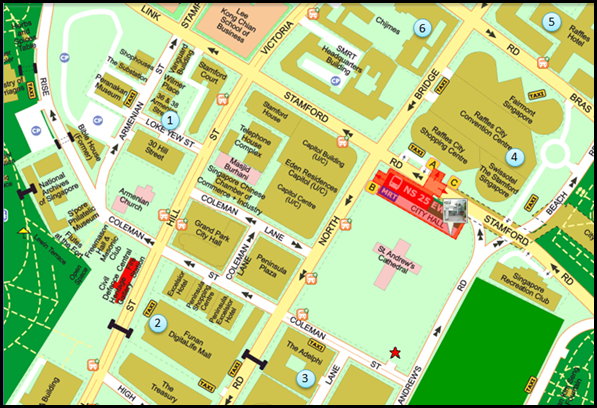 Really cheap bakeware – Sunlik Trading at Purvis Street which is 2 or 3 streets behind Raffles hotel, not in this map. If you want to look for cheap food around City Hall, you can check out this article I wrote 3 years ago. It should still be fairly accurate.